The farm Otjimbondona was bought by Ida + Steve Slaney in 1922 to farm with sheep and cattle. After Wilfried's parents, Hermann and Helga retired from farming, Wilfried and Anita, took over the farm in 2008 as the third generation of cattle and sheep farming Slaneys and subsequently added tourism to their farm venture. The original farm house was built in 1923 by a well-known Italian mason. It consisted of just two rooms at the time and was built with locally sourced stone (klip). Wilfried’s father was born in one of the original rooms in 1928. The house was extended considerably in the following years, but was left unoccupied in later years and it deteriorated to such an extent that it could not be saved, except for the two original rooms. Wilfried and Anita have been in the tourism business since 1991, offering fly-in safaris throughout Namibia and its neighbouring countries. They have always dreamt of building their own lodge and in October 2012 this dream was finally being turned into reality. The plans were drawn up by their son-in-law Thorsten and the start of their exciting adventure (and accompanying stress) began shortly afterwards. 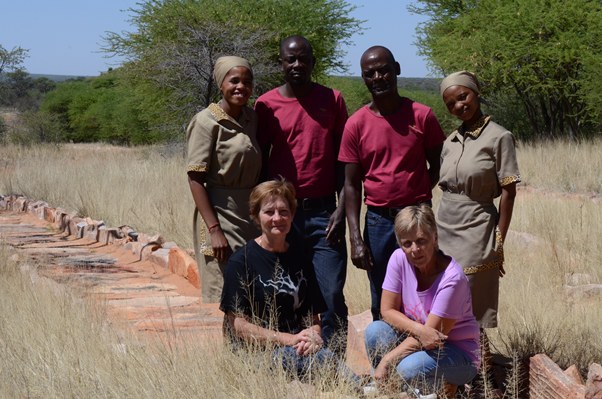 With the help of Leon Dixon, a local builder and his team, the work was completed in October 2014 and the Slaneys are now welcoming guests from around the world to come and experience the peace, tranquillity and our hospitality at Otjimbondona Kalahari. Our staff is close to our hearts, as we are a small and personal team and not only do we want our guests to feel at home, but also our staff is part of this homely atmosphere. It took a while to find the right people that make it all work, but are now happy to introduce our team. Gail and Ruffel started as farm managers for us in 2008, when we took over the farm, but still stayed in Windhoek and had our businesses there. When the lodge started a chef was needed and that is where Gail is now in her element to prepare the finest foods for our guests. She tries to use as much as possible from our local, organic meats and garden produce as available. Gail is in charge of the kitchen, not only the food preparing, but see to it that all is there. She is also still helping Wilfried with the farm work. Both are family of our farm workers and are two lovely, very young ladies seeing to the cleanliness of the lodge and make up the Villas for guests with such enthusiasm and final touches. The two, together with Elisabeth, are also helping in the laundry and are hands-on with decorating the breakfast tables and buffet. Elisabeth is the wife of one of our farm workers and is in charge of the laundry - washing and ironing all day. Haufiko, our elder, has started as farm worker some years ago and was happy to help wherever it was needed. When the lodge started he joined us at Otjimbondona as helping hand for everything. He sees to it that the Manor House is always ready for guests, lays and decorates lunch and dinner tables with a passion and sees to the dishes in the kitchen till late at night. Johnny also started as farm worker but is now in charge of all the swimming pools, the outside of the lodge as well as our vegetable garden and fruit trees. Without a doubt will he be seen in the kitchen in the evenings when the dishes get too much for Haufiku alone, always with a smile. We are happy to introduce Monica, from Oranjemund to our team as our new masseuse. She is in charge of the wellness bookings, will help as waitress and seeing to our guests. - more to Monica when she has come from her massage training and has joined us at the lodge.